If someone asked me, what was PGA for our team, I wouldn't hesitate before answering: "a milestone". I'm not talking about the prestige, that comes from the fact, that we had our own stand at one of the largest computer games fair in Poland. I'm not even talking about connections that we got, or number of interviews we gave. All this is very important and we appreciate it, since these were the measurable profits of our work. However, I think that it was not it, that was the most important thing. I consider the experience and very strong conviction that whatever we're doing, we're heading towards the right direction as the vital thing we gained during the fair. An amazing chance and a unique opportunity to prove, that a Pole can actually do it - that's how we perceive the event of this year PGA fair. 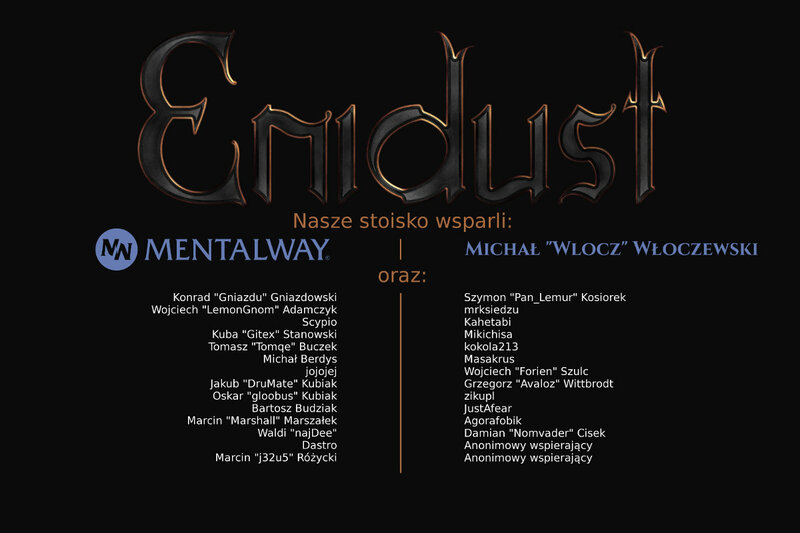 Against all the adversities, internal and external, we accomplished our first goal on the way to create our dream game: the original and written from a scratch engine of the game is READY - Enidust.exe officially exists. It was our first fair, first undertaking on such a scale. Nay! Even more! It was the first meeting of ours numerous team members. It was for the first time that we met with people, with whom we work, share ideas and laugh on a daily basis only via the Internet. It was weird, but also very interesting experience. It didn't last for long though, since we had to work as a team soon enough, like well lubricated machine cogs. Despite a slight delay and initial difficulties we managed to set stand quite efficiently thanks to great commitment, a sleepless night ( ;P ) and an appropriate assignment of work. It was thanks to fans of our project that we could be at PGA and this fact gave us the boost. In spite of what everyone might expect, preparation of an own stand is not a matter of five minutes. Every time we turned up one hour before the expected time of opening to be able to arrange our presentation and set up our equipment. We received a priceless help from LG which lent us monitors for the time of the fair. Visually, our stand was rather modest and it's central point were two screens with our original engine. Nonetheless, it was popular among gamers for whole three days. "Have you already heard about Enidust project? It's supposed to be an MMORPG with an emphasis on realism and sandbox gameplay. This is our original engine - on the left you can see a recorded video, on the right - real time presentation. Matiis, move the Sun..."
More or less this was the beginning of conversations we had with people who stopped at our stand. As mentioned before, it was rather modest, but the graphic level that we managed to achieve attracted people - they were surprised, that it's work of an independent team. "My RAM says no" - this was one of the most frequent comments. Calm down - for the time being, the game does not have so high system requirements. What's more, we are still working on optimization. For the most part of the time spent at the fair we were discussing details of the game itself - those who were curious about its mechanics were numerous. A similar number of people was interested in the origin of the idea, project, team and what we really want to achieve. The answer was always the same: "our dream is not only to create a game, but also to play it". We were one of few independent studios which exhibited an original engine and worked on its own technology. People appreciated that and were willing to talk to us. They were even asking for an interview or offering help in other way. More and less recognizable people passed our stand; they noticed a potential in Enidust - they appreciated the way in which we are heading to our goal. We talked about our project, our ideas and ambitions. We answered questions and listened to opinions. It was a pleasant honor for us to be able to take part in the debate about crowdfunding and to present our project on a small scene. It was also a great opportunity to talk to other developers and discuss eventual ideas or solutions. With studios as well as with independent teams. Even though we compete with one another, it was hard to find even the slightest trace of rivalry - everyone tried to be as helpful as they can be, sharing remarks and experience. The best example of such attitude are lectures given as a part of ZTG. We had an occasion to participate in a few. To wrap up, those three days were really arduous and we will keep very good memories of them. It did not escape our attention that is was You, who gave us this chance to appear at the fair. That is why we would like to give you all our cordial thanks to everyone who supported our project - our splendid community, our sponsors and PolakPotrafi.pl web portal. For now, we invite you to see our fair gallery. Reported by: Master Ignis & Dawro. With thanks to everyone supporting us, both not mentioned and mentioned. A token of gratitude for help during fair for LG, PolakPotrafi.pl and the organizers of PG A2014. Congratulations guys. I agree its all about the experience you gained from such an event. Keep growing, you guys definitely in the right directions.